Continuing on my house tour, the before photo is from the real estate ad. It is a combined lounge dining room. As you can see from the before photo the house was in a pretty sad state, it needed the love brought back into it.I painted the room in a soft warm gray (dulux – limed white) full strength. The ceiling has great wide cornices so to give them more emphasis. I painted them white and the flat part of the ceiling in half strength limed white. It really helps pick out the detail. The sandstone on the fireplace had smoke stains (as did the wall above it). I scrubbed both with sugar soap and then used a sealer with a stain block to make sure the stain didn’t bleed though the paint. I had decided to paint the fireplace to give a bit more life…it is not style I would have chosen but for now it will do! Same view of the room, much easier on the eye. I made plain cream curtains (I wanted linen but the cost ruled that out – maybe later) and put in new metal rods, replacing the dated pelmet boxes. You can just see the new french doors on the right hand of this picture. There was no easy access to the deck outside so I had the window replaced with the doors…it was one of the best things I have done. My new cushions from Etsy shop Milk and Cookies. A sitting area near the french doors, with my Buddah painting behind. My room has a slight Asian influence. I like the combination of classic and Asian styling. With our proximity to Asia it seems to be a natural choice. I love this transformation! The mouldings are fantastic! Great job!! Love it! I love your dining room table! It is exactly what I am looking for! Is it antique and you probably redid it! You brought wonderful life and style back into the home! 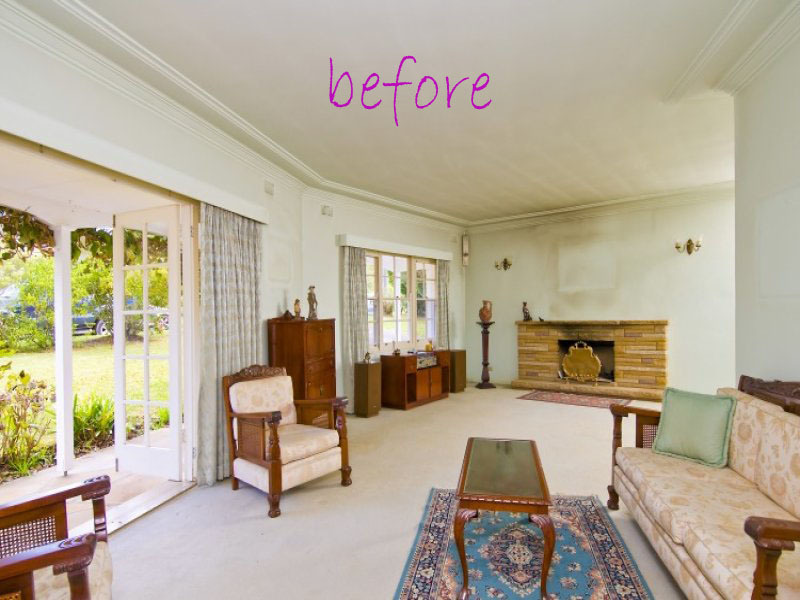 I love this room redo, absolutely stunning and fresh! I turn to your website for daily inspiration while remodeling my house. Beautiful transformation. It looks like a different space! SO much better! The room is now beautiful and elegant! Beautiful makeover! Love the soothing colors she used! Thanks for sharing. What a great arrangement for the shape of the room. It is just beautiful. Thanks for the post. Getting rid of those boxes helps soo much. And the paint and staging.. a whole new room! Beautiful! Looks so much more inviting…Great Job! Where did the painting behind the chair come from? I love it. Absoluuuuutely Stunning! Talk about taking a Vintage house with great bones into the Future, but yet staying Classic. This is it. Love it love it love it.